With a death toll of more than 250,000 people, the Boxing Day tsunami of 2004 was one of the most devastating disasters of recent history. It was triggered by an earthquake that struck off the coast of Sumatra in Indonesia. 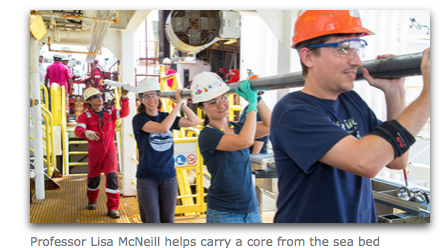 In 2016, Professor Lisa McNeill led a scientific expedition to investigate where it all began – in the seabed. Sampling an earthquake zone in situ is one of the holy grails of modern earthquake studies. Although we now have very sophisticated techniques to remotely record the earthquake process, we really needed to sample the rocks where the real action goes on.